A successful Iowa businessman who never saw the ocean until he was 30 years old and prone to severe seasickness, Bill Hatch was an unlikely fishing pioneer. But he became one of the most creative, experienced, widely-traveled and popular guides of all time. Hatch became fascinated with sailfish in Miami at the turn of the 20th century; the species was little-understood and considered a nuisance of no commercial value. Hatch's keen observations of sailfish feeding habits and experiments with baits and techniques led to his development of the first strip bait. And in 1915, he unlocked the secret to consistent captures -- the drop-back method-- which 100 years later remains integral to the sport. Hatch became one of the most sought-after guides in Florida, the Bahamas and elsewhere. In 1927, he guided Oliver Grinnell to the first successful rod-and-reel catch of a broadbill in the Atlantic off Montauk, New York. 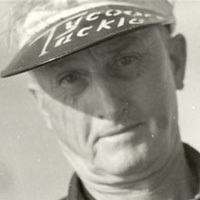 He was a marlin pioneer off the Maryland coast and twice served as coach of the U.S. team in the International Tuna Cup Match --including the first contest in September 1937. He also accompanied Michael Lerner on expeditions to Australian and Peruvian waters.